You'll be £19.99 closer to your next £10.00 credit when you purchase Air War Northern Ireland. What's this? Famously dubbed 'Bandit Country' by a UK government minister in 1975, South Armagh was considered the most dangerous part of Northern Ireland for the British Army and Royal Ulster Constabulary during the years of violence known as the 'Troubles' that engulfed the province in the last three decades of the twentieth century. This was also true for the helicopter crews of the RAF, Royal Navy and Army Air Corps who served there. Throughout the 'Troubles' the Provisional IRA's feared South Armagh brigade waged a relentless campaign against military aircraft operating in the region, where the threat posed by roadside bombs made the security forces highly dependent on helicopters to conduct day-to-day operations. From pot-shot attacks with Second World War-era rifles in the early days of the conflict to large scale, highly co-ordinated ambushes by PIRA active service units equipped with heavy machine guns, rocket-propelled grenade launchers and even shoulder-launched surface-to-air missiles (SAMs), the threat to British air operations by the late 1980s led to the arming of helicopters operating in the border regions of Northern Ireland. 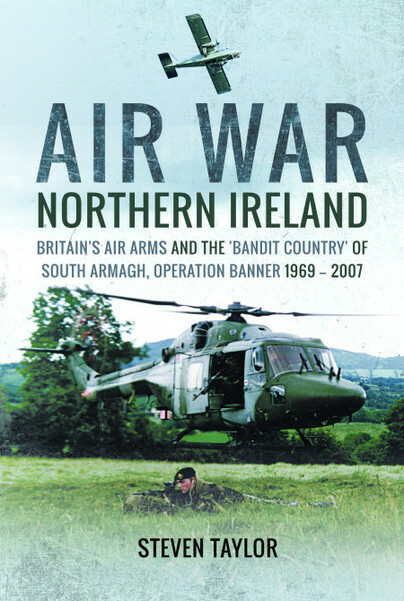 Drawing on a wide range of sources, including official records and the accounts of aircrew, this book tells the little-known story of the battle for control of the skies over Northern Ireland's 'Bandit Country'. Steven Taylor, a journalist by background, is to be commended for assembling a coherent narrative where so much of the documentary evidence remains classified. Two chapters set the scene for the use of airpower in Ireland, and how the situation developed where the IRA could deny the roads to the Army. He also highlights the IRA’s quest for countermeasures, such as heavy machine guns and surface to air missiles, used with varying degrees of success – even attempting to hijack a civilian helicopter to form a putative “Irish Republican Air Force”. The linear narrative is well written and flows well. This well-researched and often riveting account is illustrated by 17 black and white photographs. Written in a highly readable and concise style by freelance journalist Steven Taylor, the narrative rattles along, and numerous first-hand accounts provide a dramatic flavour of what it was like to be part of “the UK’s Vietnam”. Having, over many years, researched and written about military aviation in Northern Ireland, I very much looked forward to reading this book. The sub-title sets out its scope with clarity - Britain’s Air Arms and the ‘Bandit Country’ of South Armagh, Operation Banner 1969-2007. Aircrew and ground personnel from all three Services tend to remember their time in the Province as, in the main, fulfilling and enjoyable. Aldergrove was widely accepted as one of the best messes as regards catering and had a lively (if somewhat geographically restricted) social life. There was plenty of flying in fairly challenging weather, many tactical lessons had to be learned, with spares and technical support not normally being an issue (though it was claimed that the Wessex, for example, needed only a swift bang with a hammer in the right place to sort out most defects and that you only needed to worry if there were no oil leaks visible). There was also the feeling that there was a real job to do and one which could not be done without the hard won expertise of the helicopter crews. All in all it was as much satisfaction and indeed fun as could be expected in a ‘small war’. Though it always had to be remembered that for those serving on the ground, patrolling city streets and country roads, laying up in covert observation hides or waiting in a cold, wet, dark and muddy field to be extracted by air, it was more deadly than fun. As this book amply demonstrates there was a definite specific threat, as PIRA had a great ambition to shoot down which was so often termed in the Republican press as a ‘British Army helicopter’ regardless of if being RAF, AAC or FAA. The key incidents and weapons are all described in sufficient detail. This ground-to-air threat was by no means as high as would be encountered in hot and dusty places in the 21st century but dealing with it certainly concentrated minds, developed skills and was useful preparation for what was to come over Iraq, Afghanistan and Libya. The author’s concise introduction in the chapter ‘Troubled Times’ is excellent in setting the scene and context between 1919 and 1969. The only minor point of detail I would make here is that 105 and 106 Squadrons began operational patrols in the spring of 1918 and were equipped with RE8s until the end of the year. He then turns to the meat of the book – South Armagh – Bandit Country – a small geographical area with beautiful scenery but highly dangerous to the non-local. To put this in context, despite growing up in Co Antrim, I only visited South Armagh by helicopter (Chinook, Lynx and Gazelle) during the whole 38 years of Op Banner. Neither I nor my family, not anyone else in their right mind with any connection to the Security Forces would have gone there sightseeing. The author sketches in the historical background and explains just why South Armagh is different even for Northern Ireland and will help the reader to a better understanding of the Irish Question – though one point that could have been drawn out more is that the existence of the border was not only an advantage for PIRA tactically but also economically, as without a border there would have been no highly profitable smuggling of fuel, cigarettes and livestock. In reading this account you are left in absolutely no doubt that PIRA in ‘Bandit Country’ was very well-organised, motivated and skilled. It was interesting to learn that the term was coined by Secretary of State Merlyn Rees in 1975. The malign influence of supporters in the USA and the Libyan Government is also described as also are the countermeasures by the FBI, the RN and the Irish armed forces. Bearing in mind that much material is still highly sensitive, that a terrorist threat still exists and that the author limits his scope to one particular geographic part of the conflict, this is a timely, informative and accurate account. It is well-researched, very readable and concise. I certainly learned new facts and details about incidents during Op Banner, such as the dropping of CS gas canisters on rioters at Long Kesh and the IRA’s hijacking of civilian aircraft in unsuccessful efforts to carry out bombardment from the air. A small quibble would be the author’s reference to DS10 in MOD as ‘liaising between the Army and the British Government’. I worked in a DS branch and we regarded ourselves as the Civil Service jam in the sandwich trying to make sense of the wilder ambitions of the military and politicians alike. The concluding section ‘Operation Banner: an analysis of the air war’ is excellent. It certainly makes me repeat a call which I have made many times to deaf official ears – an appropriate Battle Honour should be added to the relevant Squadron Standards. Steven Taylor is a freelance journalist, based in Scotland, writing principally about military history - and in particular military aviation - who has contributed to various UK newspapers, such as the Daily and Sunday Express and Scottish Daily Record, as well as the magazines Aeroplane Monthly, Jets, Britain At War and Military History Monthly. He has also written articles about the 'Troubles' in Northern Ireland for the Belfast Newsletter and Belfast Telegraph newspapers. This is his first book for Pen & Sword.